122/365(+1), a photo by Luca Rossini on Flickr. 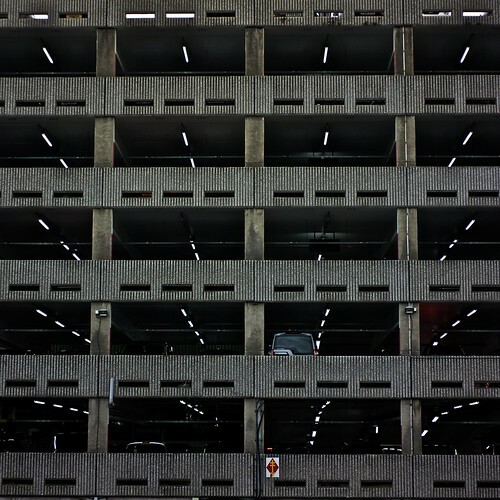 Another parking building. This time at Manchester’s Airport. I finished the meeting in Sheffield at 17.30, I collected my stuff at the hotel and I took the train to the Airport at 18.11. Then I walked to the hotel where I’m staing for the night. I decided to walk to see how it is connected to the airport. It isn’t trivial that the hotel will have a bus-connection at 4.30 in the morning, and I don’t want to find myself looking for solutions at that hour. It was probably around 7.30 when I walked by these parking lots. I liked the pattern, especially the lights inside the building. At the hotel they informed my that the company had payed only for one room (the one of my colleague) and that their credit card was now empty, so I had to take care of my accommodation. At Sheffield, they reserved one night instead of two. There’s always something wrong whenever the company organizes my travels. And every time I wonder how difficult can it be to reserve a room for the right number of days and to pay it in advance. I guess I don’t get the inner complexity of the task.